Branch Office Direct Printing is designed to reduce network traffic on expensive WAN links and potentially reduce the workload on busy print servers centrally located in your datacenter. The topic covers the architecture and design of Branch Office Direct Printing in Windows Server 2012. Works for print queues using printer drivers that support Client Side Rendering (CSR), whether they are v3 OR v4 drivers. Can be enabled or disabled via Windows PowerShell. PrintBRM will backup and restore the Branch Office Direct Printing setting on a print queue. Saves bandwidth and jobs may print faster since print jobs no longer go through server. Scalability might improve, as server load will be reduced, but exact amount depends on your organization’s printing environment and setup. Requires a print server running Windows Server 2012, and Windows 8 clients. The printer must be a network attached device. The printer can’t be locked to accept print jobs from a single IP address. It must be configured to accept print jobs from any client. Even if Branch Office Direct Printing is enabled on a print queue, clients running an operating system prior to Windows 8 will not use this setting and will still print to the server. Settings that conflict with Branch Office Direct Printing (such as Keep Printed Jobs) cannot be used. If server side rendering (SSR) is required for some specific reason, Branch Office Direct Printing cannot be used because it depends on CSR. For example, if a client computer running Windows 8 receives and installs a v4 print class driver (a v4 driver that supports a broad set of printers sharing common features) because a model specific v4 driver is not available, then CSR is not possible and thus Branch Office Direct Printing is not supported. If printer pooling is enabled on a printer queues, Branch Office Direct Printing is not compatible. All third party server-based tools will no longer work properly (quota management, job auditing, and so on.) because print jobs will no longer be routed through the server. If Branch Office Direct Printing is enabled, it will override the default SSR mode for systems like laptops and tablets. Typically, these portable computers running Windows 8 will force SSR to conserve battery power while printing. When Branch Office Direct Printing is enabled on a queue, it is assumed that bandwidth is more valuable than extended battery life, and the portable clients will switch to CSR and take advantage of the Branch Office Direct Printing feature. Branch Office Direct Printing depends on the existing CSR print technology. CSR implements a remote printer connection in such a way that the bulk of the work involved in a print job is performed locally on the client. With CSR, the print job is processed on the client and then sent to the print server. The print server then sends the spooled data to the shared print device. In Branch Office Direct Printing mode, the port on the client is replaced so when CSR is done, the job is sent directly to the physical print device instead of the print server. The implementation of this feature and its integration into the CSR feature can be broken down into several parts: Configuration, Setup, Synchronization, and Fallback. Values set on the remote printer are synchronized periodically by the client (either after an elapsed time period, or when changes on the server are detected), and when “BypassServer” is set to a non-zero value, Branch Office printing for the connection is enabled. The client may be forced to ignore this setting if it is incompatible or if conflicting settings are in effect, explained in more detail in the fallback section. Creating a connection involves setting up a local GUID printer, and as part of setting up the printer, it must be assigned a port. For both normal and Branch Office Direct Printing, this port defaults to the CSR Port Monitor until a CSR cache synchronization occurs. 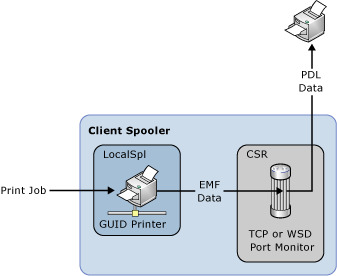 As the last step of setup, a synchronous CSR cache sync is forced for the new GUID printer – as a result, this copies over all the remote printer’s settings to the GUID printer and at this point the port settings are changed from the CSR Port Monitor to the port settings used on the server. As described above, during Setup the CSR Cache Synchronization is the point at which CSR chooses how to configure the port for the connection. 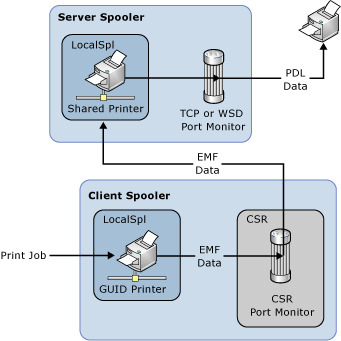 The print spooler then uses an internal work item that is responsible for keeping a single local GUID printer in sync with the remote print queue the connection it is associated with. This ensures that if the administrator changes port settings on the remote printer that they will be propagated to the client. Whether branch office printing is enabled or disabled for the connection. If Branch Office printing is enabled and if the remote port settings differ from the local ones, the local settings must be synchronized. 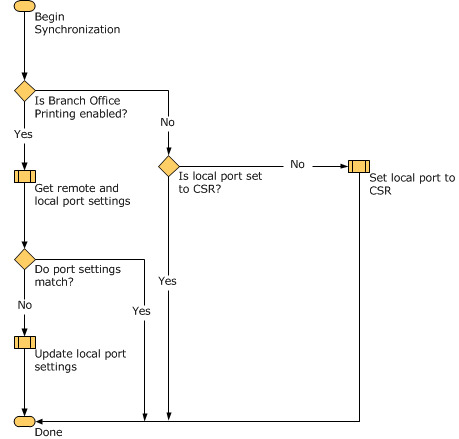 If Branch Office printing is disabled, then the local port must be set to the CSR Port Monitor in order to allow normal operation of the connection. After these settings are checked the local port is updated accordingly and synchronization is complete. The registry value that determines whether Branch Office Printing is enabled for the connection is contained in the GetPrinterData value EnableBranchOfficePrinting. If this value is zero or unset then Branch Office Printing is disabled, if set to a nonzero value then the feature is enabled as long as no other settings conflict with it and the connection hasn’t been determined to be incompatible. A table of conflicting settings and their resolution is defined in the Fallback section. The CSR Sync manager in general runs in a polling mode such that it pulls down settings from the server periodically. Since the sync manager is used for synchronizing port settings, there is the potential for a window where the client’s port settings are out of sync with the server’s. If a client were to print a job to a Branch Office printer during this time the job would fail or go to the wrong place. To eliminate this issue, a synchronous cache sync is forced on the client at the start of every job. This insures the settings are up to date at the time when they are needed most. To reduce the performance impact, only port information is synced, not a full printer sync. There are mutually exclusive settings, some of which cause automatic fallback (either to CSR or SSR, both through the server). If either condition occurs there are events logged to the event log. Printer falls back to Server side rendering if the enhanced point and print driver is used. SSR Fallback occurs if the driver in use does not support CSR. CSR Fallback occurs if port settings are not WSD or TCP. SSR Fallback occurs if admin has manually enabled SSR on the given queue. CSR Fallback occurs if the Keep printed jobs setting is enabled on the given queue. CSR Fallback occurs if printer pooling is enabled on the given queue. In each of the above cases, the client will fall back to normal printing and an event will be logged explaining why for administrative purposes. To make the fallback apparent to the administrator, warning events are logged on the server as well. The server checks whether incoming jobs are from clients that should have Branch Office Printing enabled but go through the server instead. See the following tables for more information about these events. Connection '%1' has been reconfigured for normal operation because the queue has been configured for Server Side Rendering. To re-enable Branch Office Printing, enable the 'Render Jobs On Client' setting on the server queue. Connection '%1' has been reconfigured for normal operation because the 'Keep Printed Jobs' setting is enabled on the queue. To re-enable Branch Office Printing, disable the 'Keep Printed Jobs' setting on the server queue. Connection '%1' has been reconfigured for normal operation because branch office printing has been disabled. Connection '%1' has been reconfigured for normal operation because the queue is incompatible with branch office printing. Connection '%1' has been reconfigured for normal operation because the client is incompatible with branch office printing. Connection '%1' has been reconfigured for normal operation because the server is incompatible with branch office printing. Connection '%1' has been reconfigured for normal operation because the remote port is incompatible with branch office printing. Connection '%1' has been reconfigured for normal operation due to an internal error, %2.